With Discovery now in the final two week stretch before launch on STS-119, the Mission Operations Directorate (MOD) has reviewed many critical aspects of Discovery’s upcoming flight, including rendezvous options with the International Space Station (ISS), the mission’s flight design and dynamics, and the associated Launch On Need (LON) mission which would be supported by Endeavour. One of the primary aspects concerning Discovery’s mission is her docking to the ISS on Flight Day 3 (FD-3). In order to protect for a FD-3 rendezvous, the ISS has to perform a series of reboost maneuvers via the Station’s Service Module (SM) main engines. These series of reboosts were scheduled for January 14 and February 4; however, an anomaly detected during the first reboost on January 14 has forced a temporary postponement of the second reboost. “The next ISS reboost with one or both SM main engines on February 4 is currently on temporary hold until results from the last SM reboost on 1/14 – which showed higher-than-usual structural oscillations – have been reviewed in depth,” notes a processing update on L2. These near-term reboosts are necessary to adjust the ISS’ orbital phasing – or central angle – for not only Discovery’s docking on February 14 but also the Progress 32 docking on February 13 and the Soyuz/18S rendezvous in late March with the Expedition 19 crew. Detailed analysis of the structural oscillation by Moscow has revealed a possible root cause for the anomaly. The update goes on to note that the Motion Control System and the filter are functioning properly and that corrective measures are underway to ensure a good and proper reboost on February 4. Meanwhile, reboosts by Progress or by Shuttle are not on hold as there is currently no reason to believe that this type of structural oscillation would be seen during reboosts by these two crafts. Furthermore, once the final reboost maneuver is complete, it will set up seven consecutive days of FD-3 rendezvous capabilities for Discovery. One of the first items discussed in the MOD Flight Design and Dynamics presentation is the launch and landing times for Discovery. 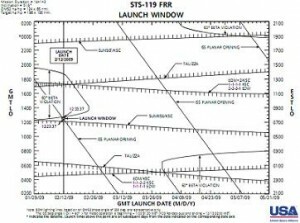 Assuming a launch on the opening day of the launch window – February 12 – Discovery’s daily launch window would open at 7:23:37am. EST and close at 7:33:37am EST. While the entire launch window is available for the launch team, managers would prefer, as always, to launch Discovery in the center of the launch window to take full advantage of the vehicle’s performance and propellant margins. This translates to a launch at 7:28:37am. EST. Concurrently, should Discovery launch in-plane on February 12 – and assuming her mission is not extended or shortened – Discovery would return for a landing at the Kennedy Space Center on February 26 at 2:19am EST after nearly 14 days in space. During launch, the MOD has determined that Discovery’s DOLILU (Day Of Launch I-Load Update) will be a High Q design with an I-load Design of 2,156lbs. This calculation is based off of a five minute window centered in-plane with a projected Ascent Performance Margin (APM) of 1,303lbs and an 88 secs OMS assist burn during ascent. This sufficient overlap, and Discovery’s liftoff weight and Center of Gravity, negates the need to perform a Contingency Abort Black Zone (CABZ) analysis. Per Shuttle flight rules, a CABZ assessment would be needed if the liftoff weight of the Space Shuttle exceeded 259,000lbm (pounds mass) and the Center of Gravity aft exceeded 1,115.0 inches. For STS-119, Discovery’s liftoff weight will be 266,398lbm and her Center of Gravity aft will be 1,110.8 inches. Continuing the detailed assessment of all aspects of Discovery’s flight design, the FRR presentation notes that Discovery’s Forward Reaction Control System (FRCS) will be loaded with 1,912lbm of propellant, her Aft RCS with 4,970lbm of propellant, and her OMS with 22,761lbm of propellant. This provides Discovery’s crew with a propellant margin of 28lbm in the Aft RCS and OMS and a 2lbm margin in the FRCS. Furthermore, a multi-stage de-orbit contingency is in place, and will be performed, should an emergency payload return case arise during the early stages of the mission – such as an Abort to Orbit scenario that results in Discovery not being able to reach a high enough altitude to perform a contingency docking with the ISS. In addition to these designs, Discovery will be flying with the SRB/ET stack that was originally intended for STS-125 – and mated to Atlantis – last October. “STS-125 stack is a better performing stack than STS-119 original stack,” notes the FRR presentation, one of over 43 STS-119 FRR presentations available for download on L2. As a result of this better performing stack, the SSP has removed the gaseous nitrogen offload because of the gains in the APM. Likewise, as was done with STS-126, Discovery will fly with a modified SSME Controller Mixture Ratio. Since Return to Flight, mission engineers have noticed a marked decrease in the SSME Controller Mixture Ratio – especially on Endeavour’s missions. On STS-126, a recalculation of the SSME Controller Mixture Ratio was debuted without issue. As such, STS-119 will fly with the same SSME Controller Mixture Ratio as was flown on STS-126 last November. Furthermore, the MOD reviewed two issues that were seen during STS-126, the unexpected shutdown of the TRS backup and the rendezvous radar issue. On the TRS issue, “Power cycling of failed Data Distribution Switch,” notes the FRR presentation. As of the MOD FRR, the issue is being tracked as a non-standard open work item with coordination between Navigation and Fault Summary Message. The second and final item reviewed from STS-126 was the rendezvous radar anomaly. The anomaly relates to the Ku Radar’s transmittal of corrupt and unusable data to Endeavour’s Flight Crew during undocking operations. The issue has been tracked to suspect Shuttle hardware on Endeavour and therefore is not expected to have any impact to STS-119, though the Flight Crew has been briefed of any issues that may arise. Lastly, the MOD reviewed Launch On Need (LON) requirements for STS-119. Specifically, the need to launch Endeavour on the potential rescue mission in mid-May, despite her primary mission’s slip to at least mid-June because of the on-going manifest realignments around the STS-125 mission to Hubble. While a decision – which is expected on April 1 – on whether STS-125 (and it’s related LON flight STS-400) will use a dual or single pad option for pad processing activities, NASA managers have given the go ahead for STS-125 to process toward a mid-May launch. However, should Endeavour need to rescue the crew of Discovery from the ISS, the LON procedure would call for Endeavour to be mated to Atlantis’ Hubble stack, rolled out to Pad-A, have the STS-127 payload installed into her Payload Bay, and then launched in mid-May. As was seen with LON planning for STS-126, Endeavour would “fly the next flight” if she needed to rescue Discovery’s crew, essentially performing some of the mandatory (CAT I) tasks associated with the STS-127 mission before returning to Earth.